James has been interested in Japan for some time now. I can’t remember why or when it started. Last fall he researched Japan on his own, outside of school, and wrote a report about the country and culture. We looked up pictures online and read Wikipedia together. We were quite impressed when he talked to his teacher and asked if he could present to the class. She agreed and even pulled up the pictures he’d found online to use while he spoke. Fast forward to this semester – James’s new plan is to go with a few friends to Japan for college. One of the kids’ parents have friends there so the boys are planning to stay with them. Then they want to rent a studio to work on their film making. James is very interested in Japanese animation and the boys are planning to work together. One of the other boys’ mothers texted me last week and said, “So I hear our boys are headed to Japan!” I think it’s wonderful that James is dreaming big. I love that the world is wide open to him and the possibilities are endless. It really is amazing to sit and listen to his plans and dreams. So, James pulled Kenny’s Sushi book off the shelf, read it, made a shopping list, and Kenny took him shopping for ingredients. They decided to use cooked crab and shrimp versus raw fish; handling fish requires such care to keep it the right temperature. I did some prepping and chopping for them, but the boys put everything together. It was delicious! They made rolls to order for each of us and we loved it. 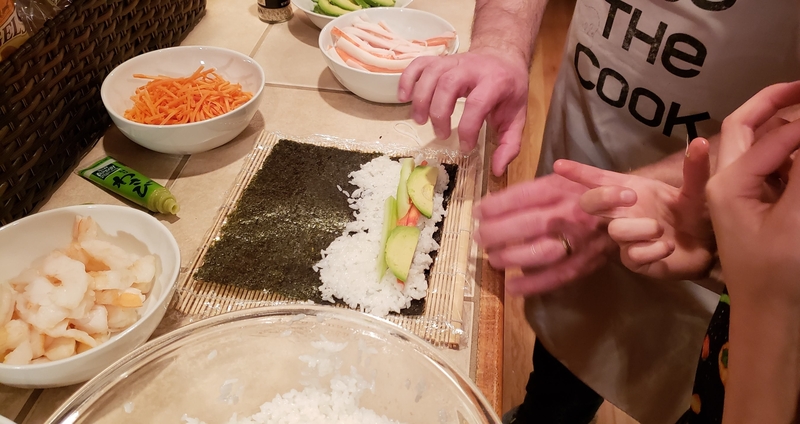 James discovered why sushi is so expensive at a restaurant – it’s a lot of work to make them! It took much longer than he anticipated but he hung in there and worked until the end. Uncle Steven, you would have been proud of the boys!